A solid steel constructed zinc plated 25mm x 10mm frame with 12mm diameter infill bars. Height 3' and fits 6' 0" opening. 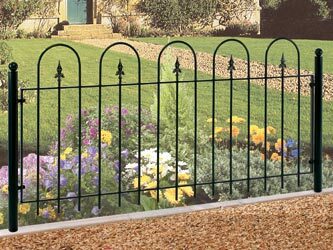 Supplied with fixings for timber, brickwork or steel posts. Supplied powder coated Dark Green with Antique Gold effect railheads.